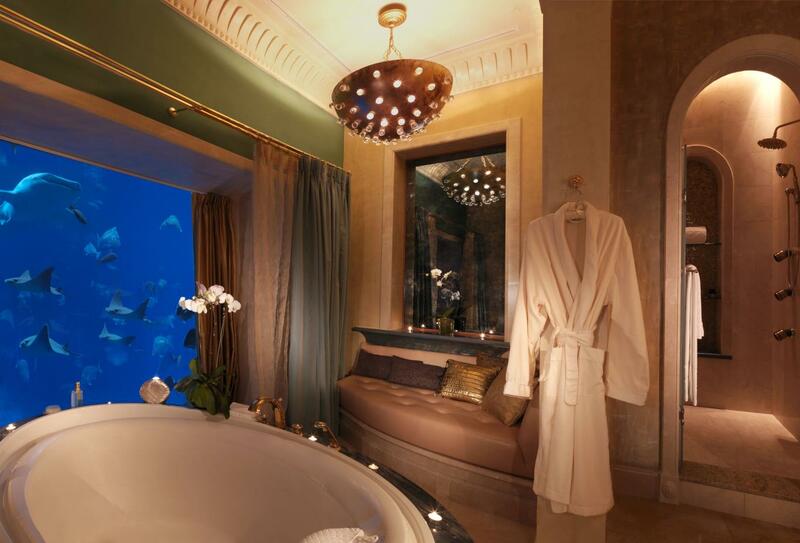 Atlantis The Palm, Dubai is the iconic resort situated on the crescent of Dubai’s Palm Island. 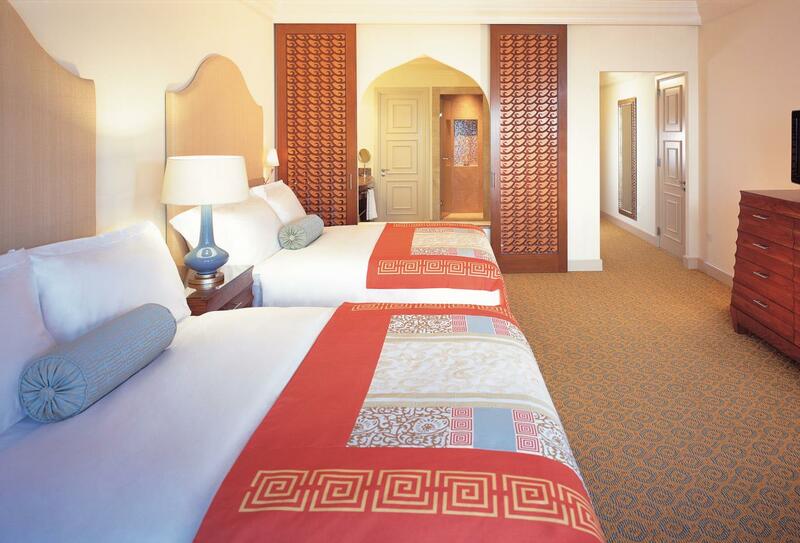 The resort is an ocean themed destination and guests staying here have the benefit of unlimited access to Aquaventure Waterpark and The Lost Chambers Aquarium. The resort has 2 outdoor swimming pools, tennis courts and academy, ShuiQi spa and fitness centre and Kids Clubs for loved ones aged 3 to 17 years. 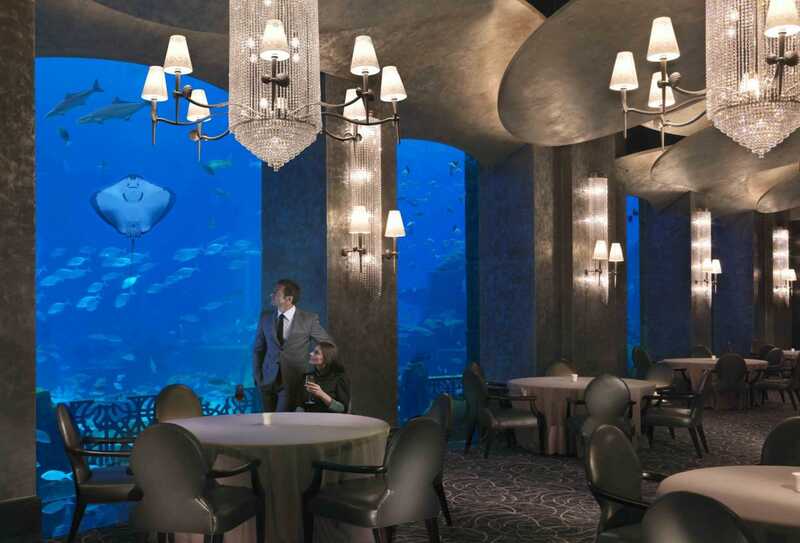 There are 23 restaurants and celebrity chef experiences including Gordon Ramsay and Giorgio Locatelli. 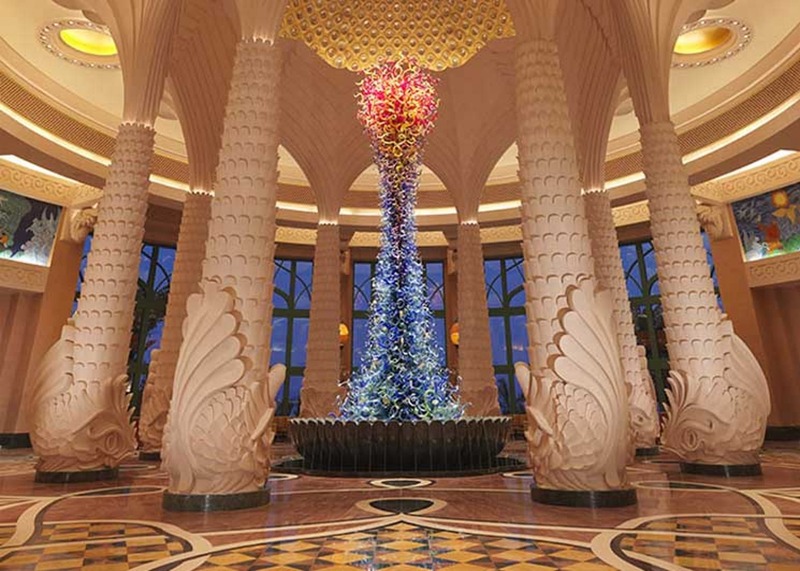 Complimentary return airport transfers from Dubai International airport – reservation in advance. Conditions apply. 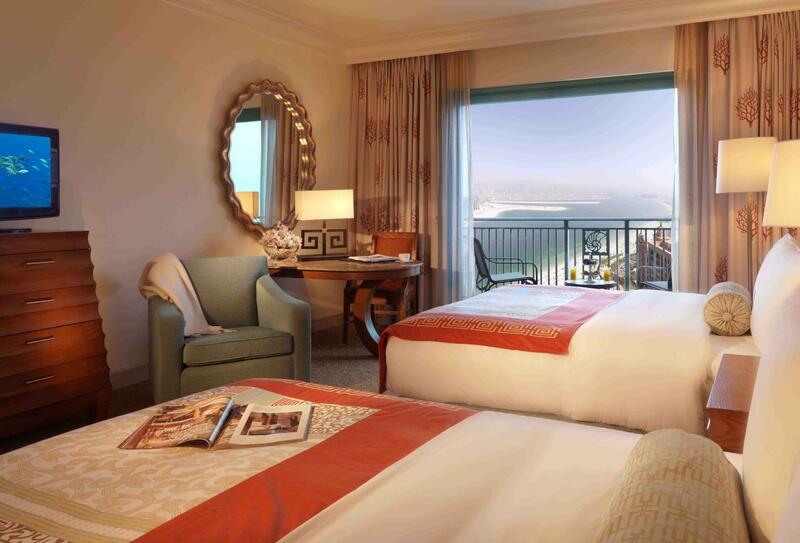 The Ocean Room has partial views of the Arabian Sea and sunset. 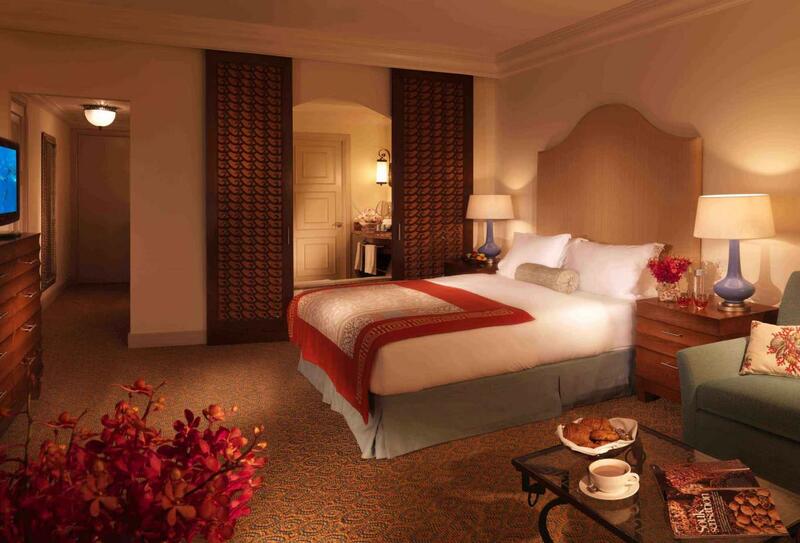 Guest room with subtle oceanic and Arabian influences and a balcony with views of the Arabian Sea or Palm Island. 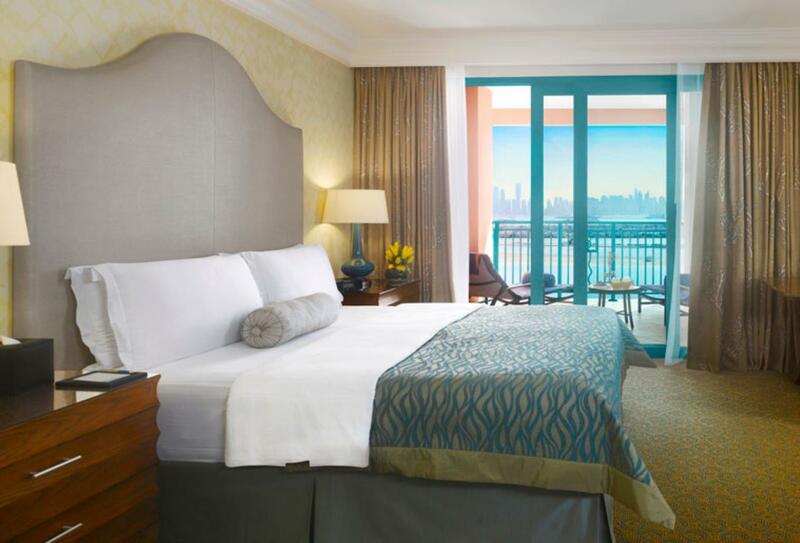 Guests staying in this room can admire views of the pristine beach, Palm Island and Dubai Skyline from their balcony. 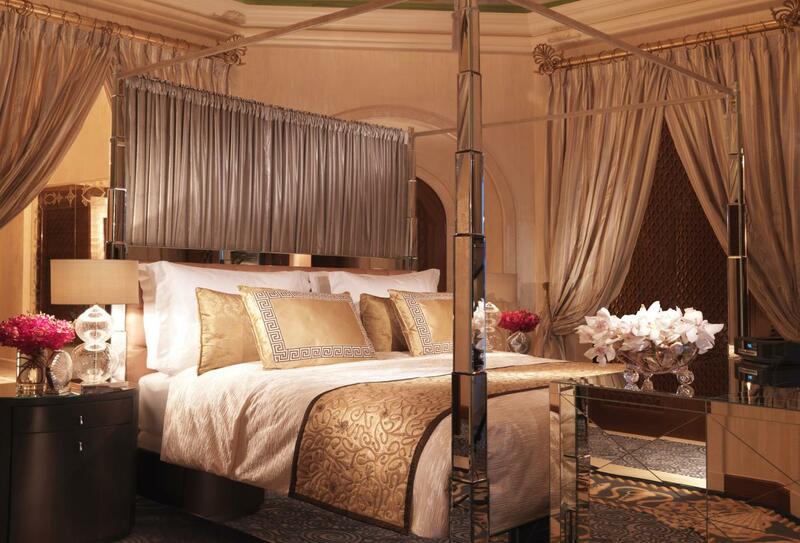 This king-size bedroom with views of the Arabian Sea has Imperial Club benefits. 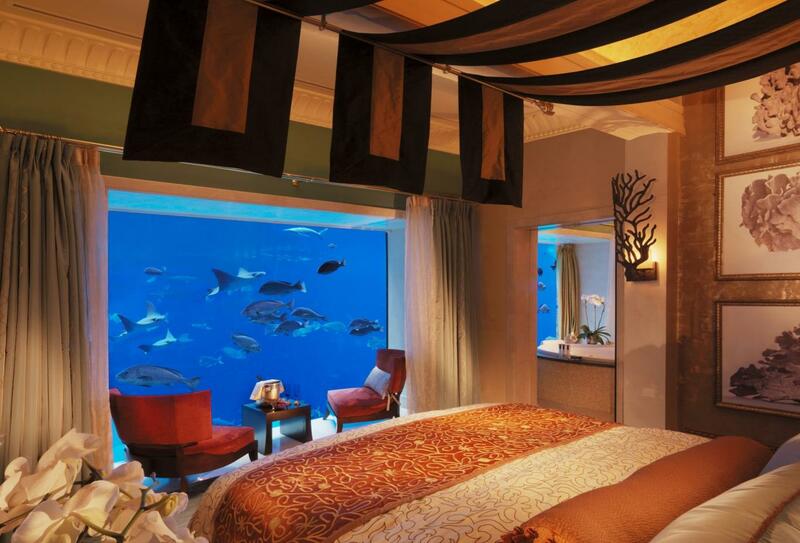 This room has two queen beds and views of the Arabian Sea. Imperial Club benefits. 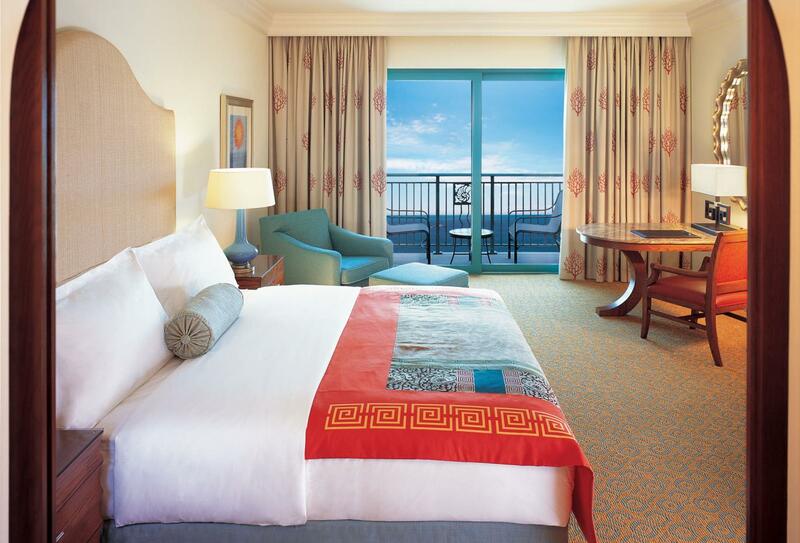 This suite has a balcony overlooking the ocean or The Palm tropical landscape. 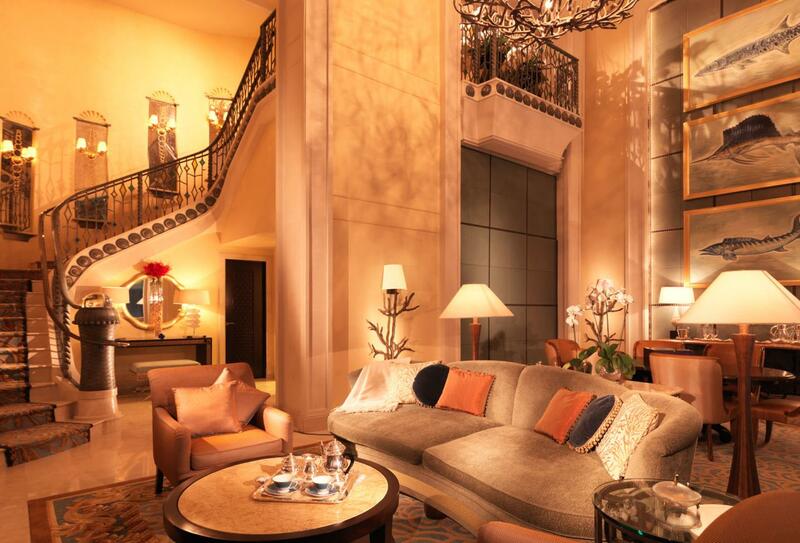 There is a separate living room and king-size bedroom with bathroom. 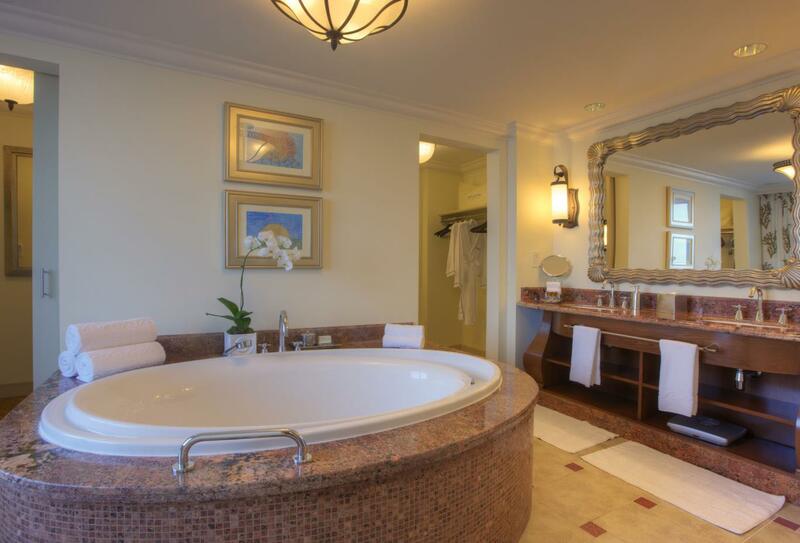 This suite has one bedroom, living/dining room and bathroom with tub and shower. 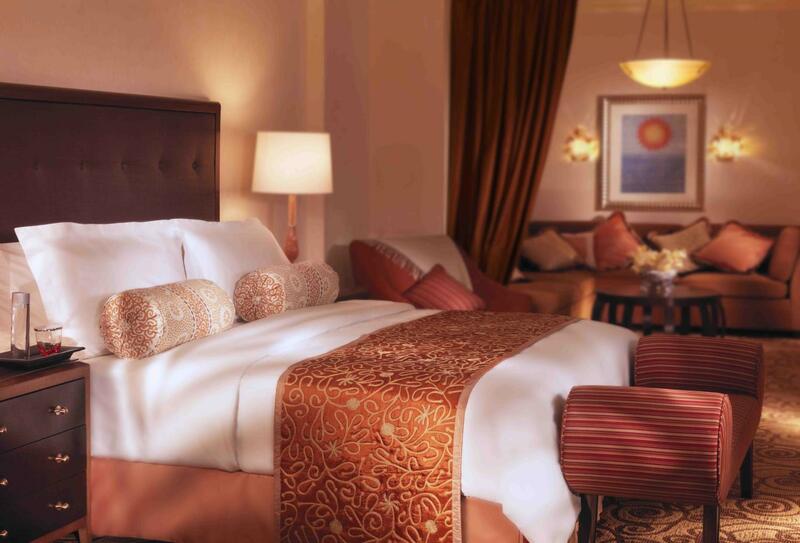 The One Bedroom Regal Club Suite has a king-size bedroom, living/dining room and bathroom with freestanding tub, shower & twin vanities. 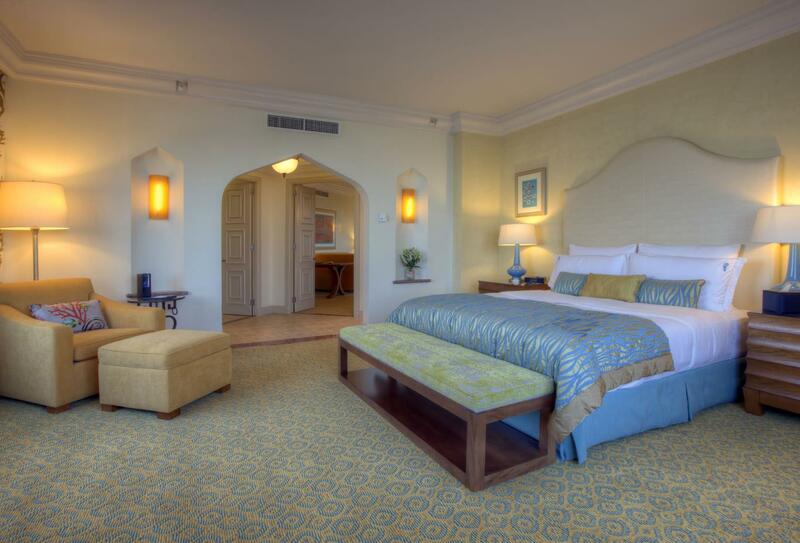 This suite has a balcony overlooking the ocean or The Palm tropical landscape. 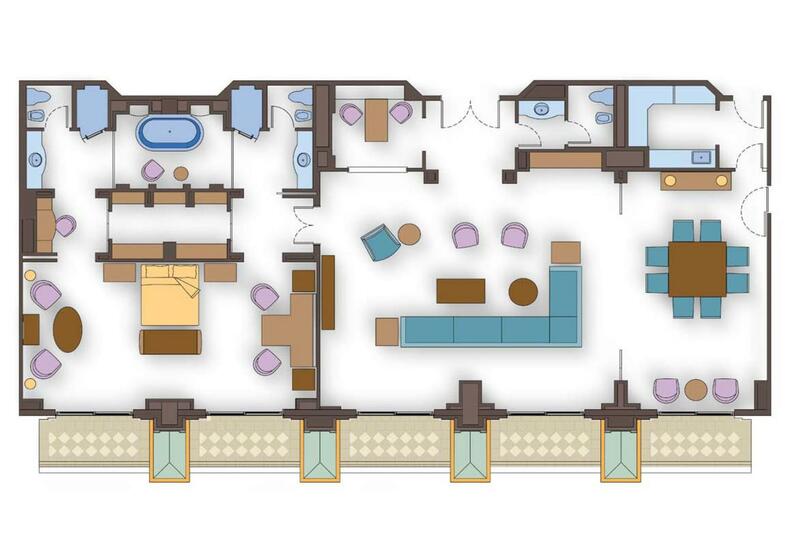 There is a separate living room and two bedrooms and two bathrooms. 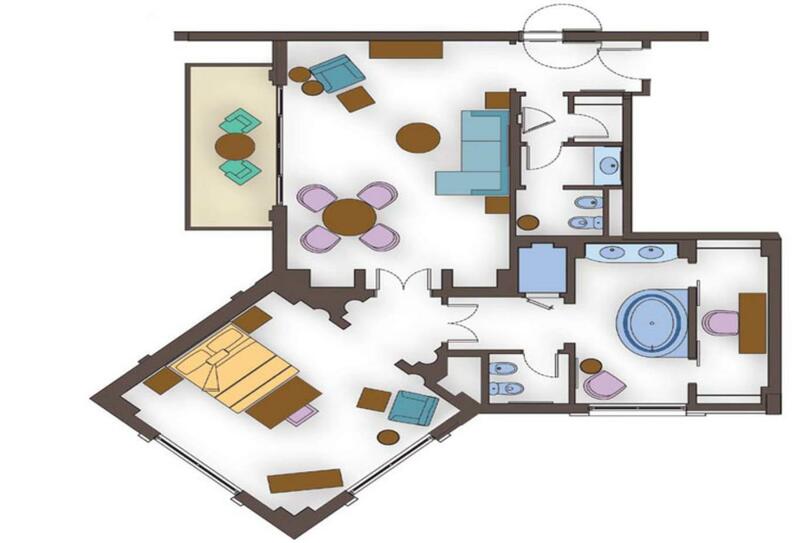 This suite has two bedrooms, living/dining room and two bathrooms with tub and shower. 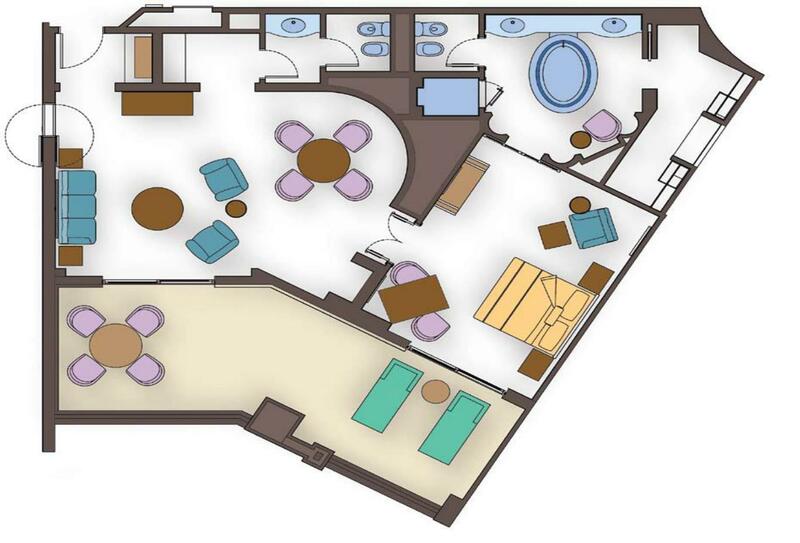 This suite has two bedrooms, a living/dining room and two bathrooms it is ideal for a family. 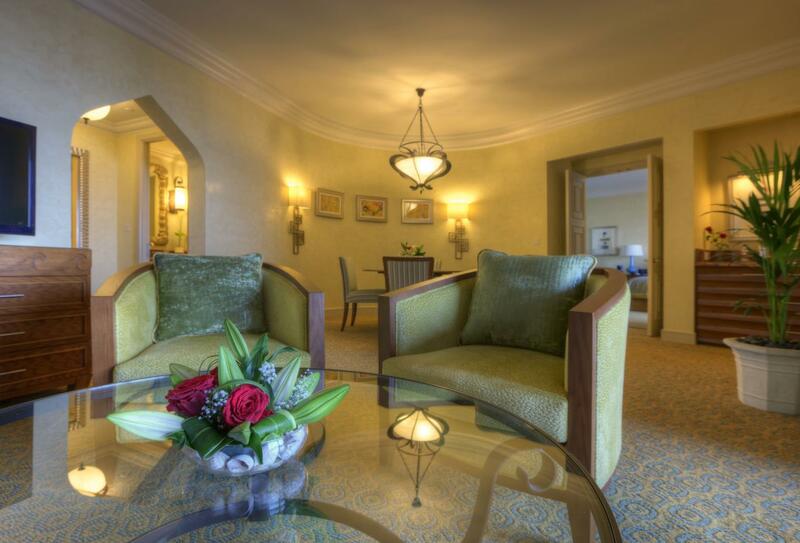 Situated on the upper floors of the Royal Towers the Presidential Suite has two bedrooms and has Signature Suite benefits. 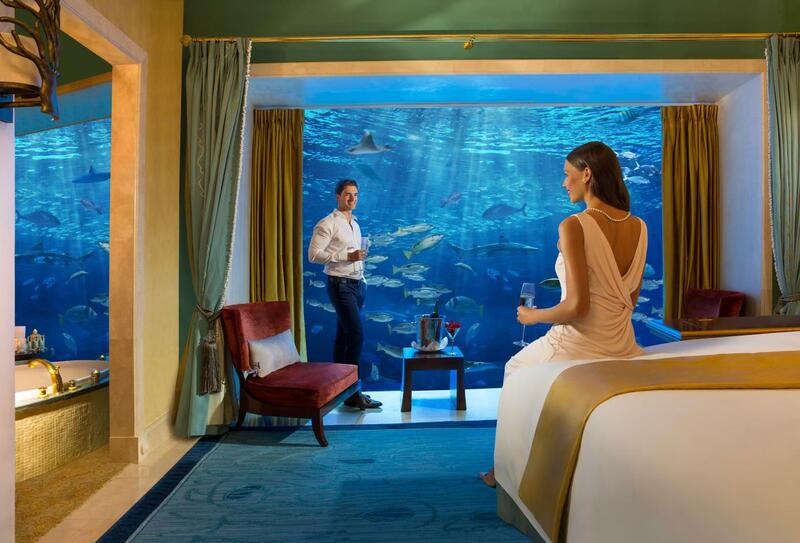 Immerse yourself in the Underwater Suite which looks into the depths of the Ambassador Lagoon from your king-size bedroom and en-suite bathroom. 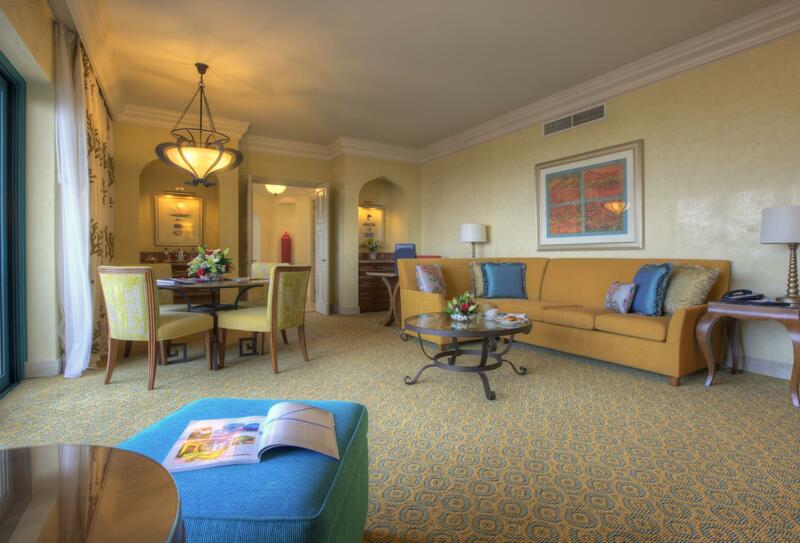 The Grand Atlantis Suite is entered through an impressive private lobby which enters in to a lounge, dining room and kitchen. 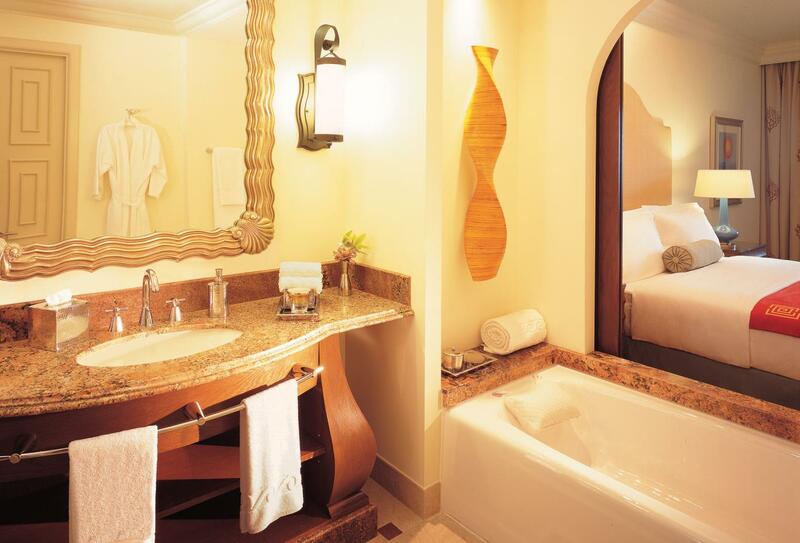 The two bedrooms have bathrooms with freestanding tubs and walk-in showers. 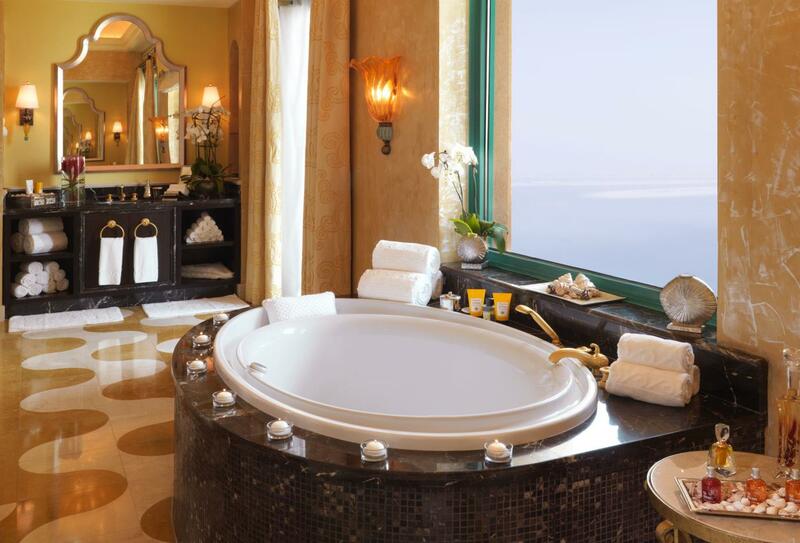 Balconies from each room provide views across the palm and the Arabian Sea. 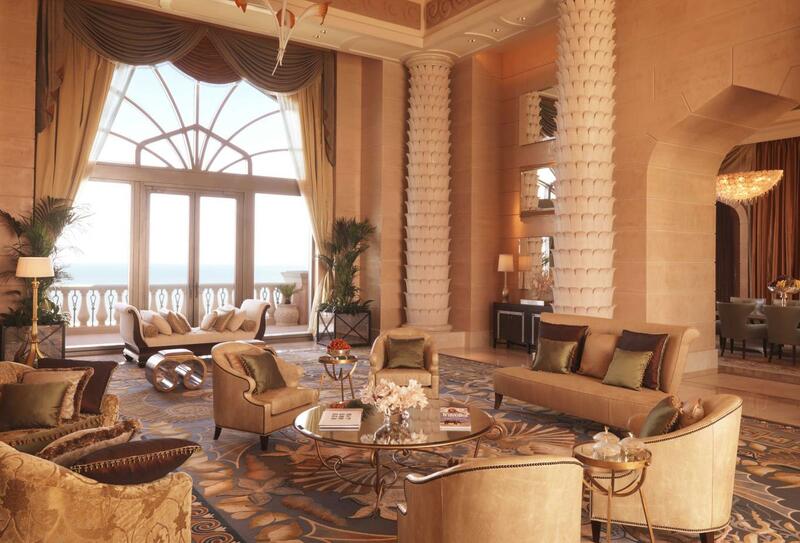 This three bedroom suite overlooks the Palm and Arabian Gulf. 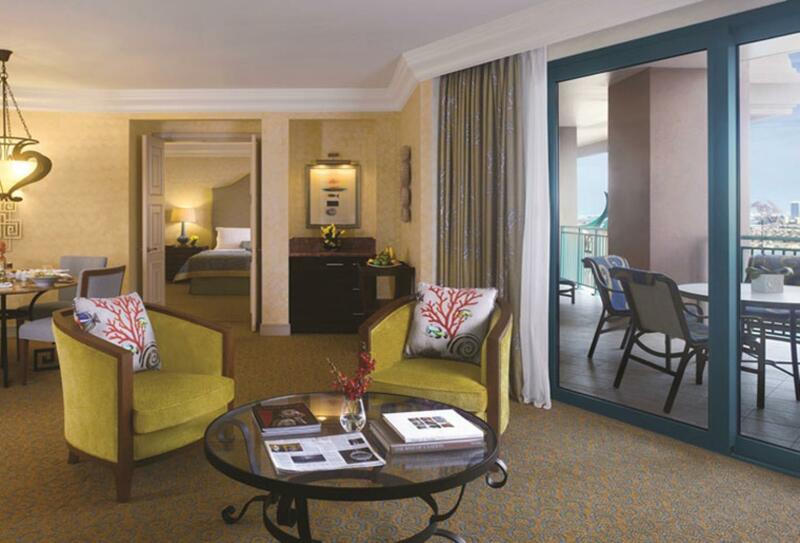 A particular feature of the suite is a games and entertainment room with pool table. 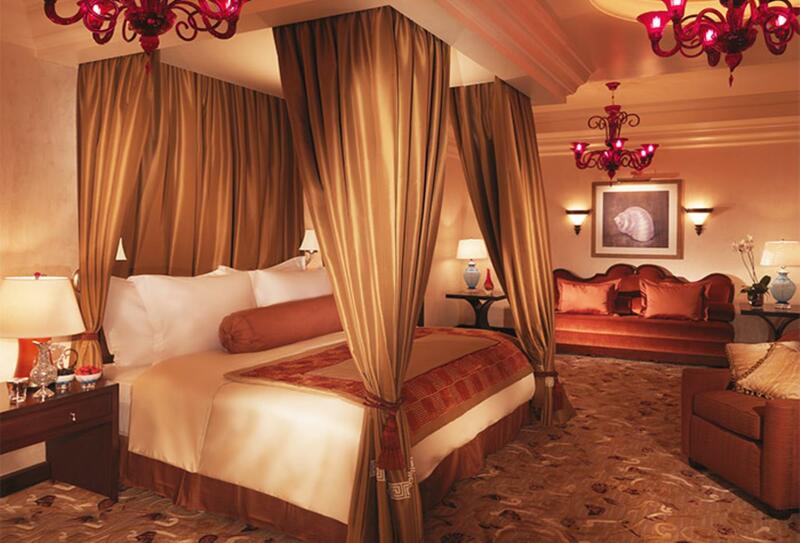 The master bedroom has his and hers en-suites and all the bedrooms have direct access to a balcony. Legendary Japanese restaurant, Nobu offers fusion blending of Japanese and Peruvian ingredients. Open for dinner and Nobu High Brunch on Friday. Age restrictions. Authentic Italian food and featuring a wood fired pizza oven Ronda Locatelli is the outpost for Michelin starred chef Giorgio Locatelli. The focus here is on great quality meet grilled to perfection. Choose steaks from around the world but their Honey Glazed Miso Salmon is also recommended. Open for dinner except Tuesday. Beachfront restaurant serving international cuisine including Mediterranean favourites and Asian sushi and Sashimi. Open for lunch and dinner. Nasimi Beach open until sunset Monday to Saturday on Friday and Saturday – live DJ from 14.00.
International and local cuisine served from buffet stations. Open for breakfast, lunch and dinner. Traditional Arabic tastes in a café setting. Open during the day for drinks. Afternoon Tea from 14.00 – 17.30. South East Asian buffet restaurant. Open for lunch or dinner. The Burger Joint serves freshly prepared, 100% pure beef burgers plus Rooster Booster chicken and Mighty Veggie options accompanied by crispy home-made fries and an assortment of tempting milkshakes. 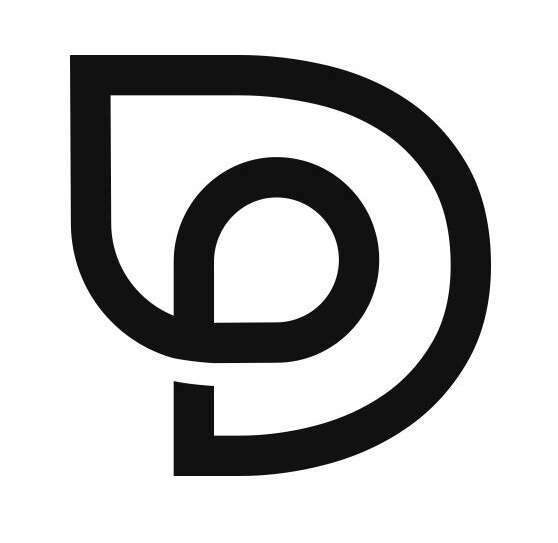 Open 11.00-22.00 on weekdays, 11.00-23.00 on Thursday/Friday. Tex Mex food located next to the Royal Beach and Royal Pool. Open for lunch and dinner. Bar open from 10.00 – 22.00. There are 15 restaurants and kiosks at Aquaventure serving Dosas, Thai, Korean BBQ, Ice Creams and more. 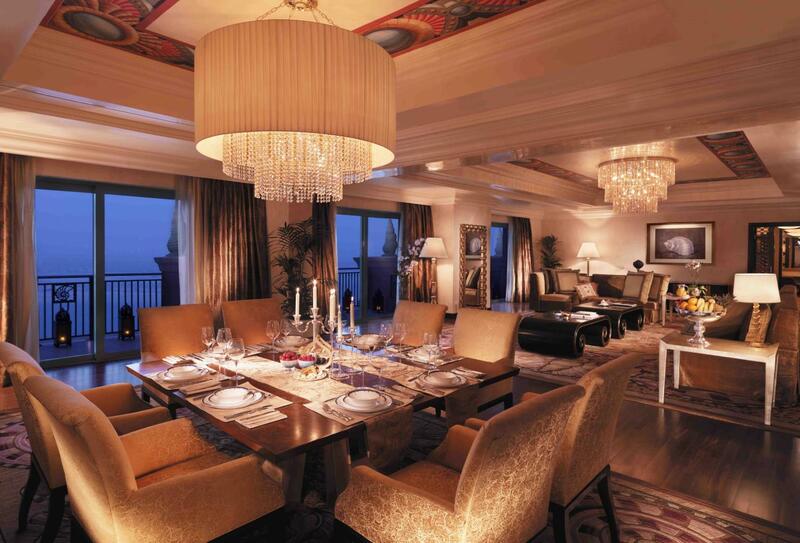 Choose to dine in an oriental inner courtyard or the principal house both offering Chinese style, harmony and nature. This elegant restaurant provides a contemporary yet traditional menu of mouth-watering Cantonese and Szechuan dishes using the freshest ingredients alongside western cooking methods. Open Saturday to Wednesday 18.00-23.00, Thursday, Friday and public holidays 18.00-23.30. Lunch 12.30-15.00. Far Easter Cuisine in a casual atmosphere. 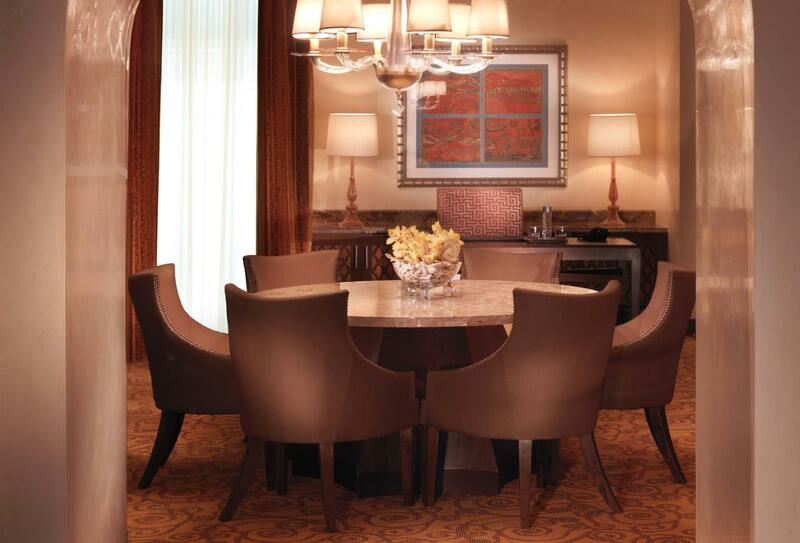 Open kitchens ensure guests are entertained. Open for lunch and dinner. British and Modern European Food mirroring the lively warehouse style of Gordon Ramsay’s London venue. Open for lunch and dinner and on Friday Brunch. Ayamna means ‘The Good Old Days’ and the food here is deeply rooted in Arabic and Middle Eastern childhood memories. Open for dinner except Mondays. The food at Hakkasan is a modern interpretation of authentic Cantonese and it is served amongst intricate carved wood screens and latticing which provides a private and oriental atmosphere. Open for dinner. Arabic street food and a sandwich lover’s dream. Open for lunch and dinner. Gourmet burgers and fries. Open for lunch and dinner. Looking into the Ambassador Lagoon enjoy coffee, tea and pastries. Open during the day until 22.30. 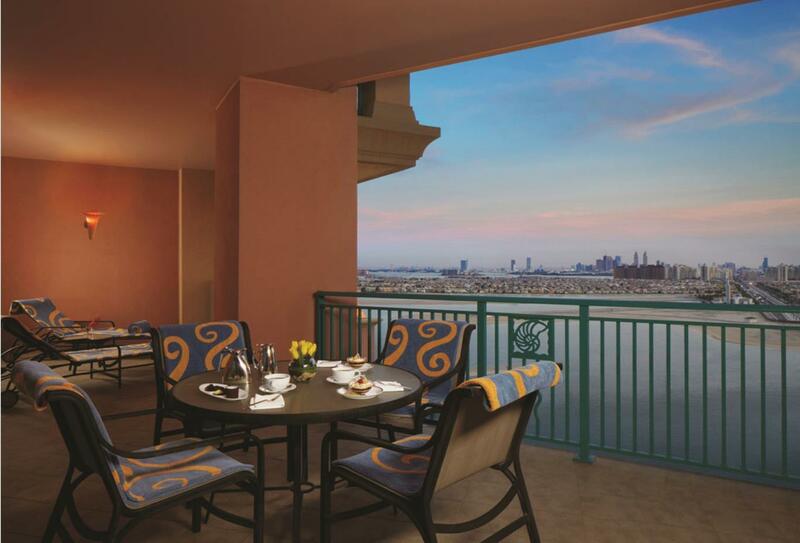 Overlooking the Palm, this is the perfect spot to enjoy a tasty cocktail and lite bites accompanied by an extensive shisha flavours. 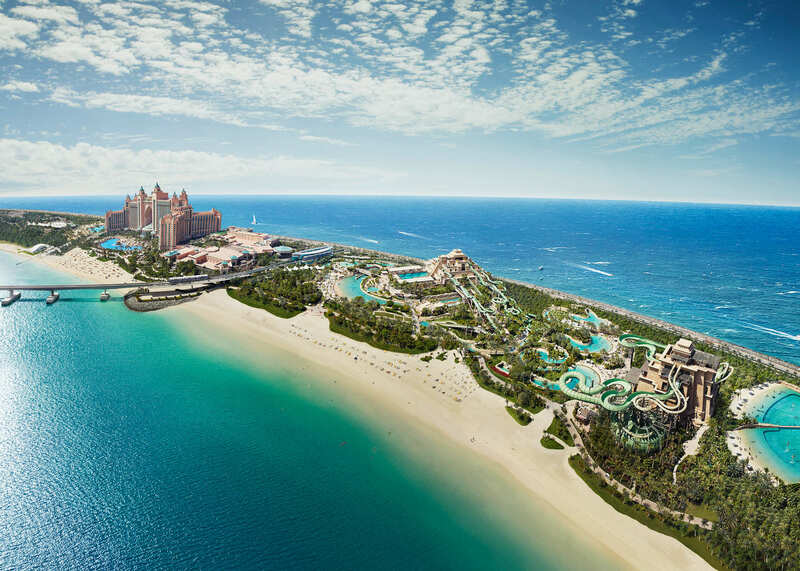 Atlantis, The Palm Dubai is on the man-made island of Palm Jumeirah, 23 miles and 30 mins from Dubai International Airport. 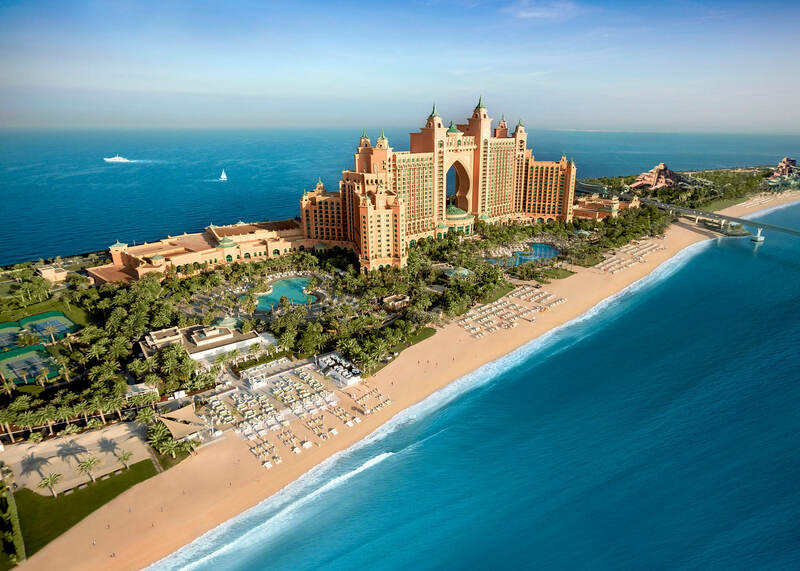 Atlantis, The Palm Dubai welcomes families with children of all ages and offers the following facilities and services to ensure they have an enjoyable stay. *Note that adults aren't allowed in the Kids Club during operating hours. Parents of children aged 3 and under must hire a babysitter. 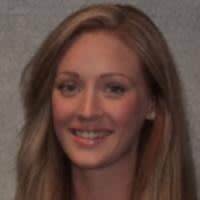 A one to one babysitter is required for any child younger than 18 months in-room babysitting. A one to one babysitter is required for any child younger than 36 months around the resort or in the Kids Club. They do not provide babysitting services for 24 hours. 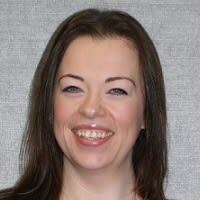 The babysitter can stay in the room from 7:00 until 3:00 at the latest.